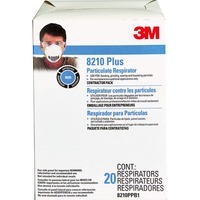 Particulate respirator offers protection from nonharmful dusts from sanding, grinding, sawing and insulating particles. Advanced filter media promotes easier breathing. Respirator is not for use under such adverse conditions as high heat and where sparks are present. Design features an adjustable nose clip. Respirator is NIOSH approved N95.